Business of creative animation <GON> in China has started successfully. <GON> received 130 million hits on several internet video channels including Youku, Tudou, and iqiyi. Daewon Media Co., Ltd. announced that the creative animation <GON> is getting a favorable response in China. Especially, <GON> was ranked No. 1 after two weeks of its broadcast on internet TV channels from August, 2016. From the first week of August, 2016, Daewon Media is expanding its broadcasting platform through several Chinese internet TV channels including Youku, Tudou, and iqiyi. <GON> received the most clicks on ‘iqiyi’ for its highest increase rate of the week. ‘iqiyi’ is the most popular internet broadcast, and <GON> was officially aired from August 8, 2016, after its test broadcast on the first week of August. <GON> was ranked No. 1 after two weeks of its official broadcast, and this result reflects the popularity of <GON> in China. ‘iqiyi’ announced on its homepage that Chinese animation ‘New Big Dad and Tiny Dad’ was ranked No. 2, British animation ‘Peppa Pig’ was ranked No. 3, Korean animation ‘Mini Force’ was ranked No. 7, and Lego’s ‘Ninja Go’ was ranked No. 8. 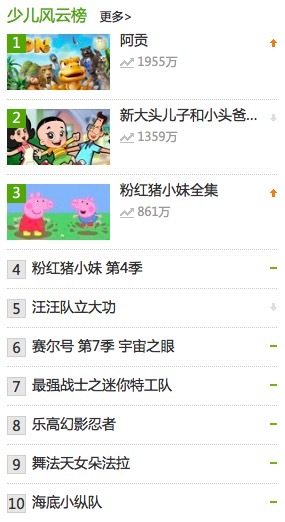 This also shows that <GON> is the most popular animation in China, recently. <GON> received more than 100 million hits on all internet video channels in China including Youku, Tudou, and iquiyi. The number of hits was 130 million on August 22, 2016. <GON> is now well established in the animation market of China. The character value of <GON> is increased through China’s national television station CCTV, and other internet channels including Youku, Tudou and iquiyi. The increased value is connected to various character licensing businesses. A lot of commercialization contracts with various products are being entered recently. Furthermore, <GON> is planning to participate in ‘2016 China Shanghai Licensing Expo’ as one way of active marketing.